Not Quite Donna Reed: Do You Set The Table? In the 1950's most homemakers set the table properly for each and every meal. A set of every day dishes was used for the weekly meals, while the special china was reserved for Sundays and celebrations. Even the most modest of homes had a set of china. The collection of china was a must for the new wife and homemaker. Sadly, the tradition of china has fallen by the wayside! Yet, the hunt for vintage china and day dishes seems to be on the rise. 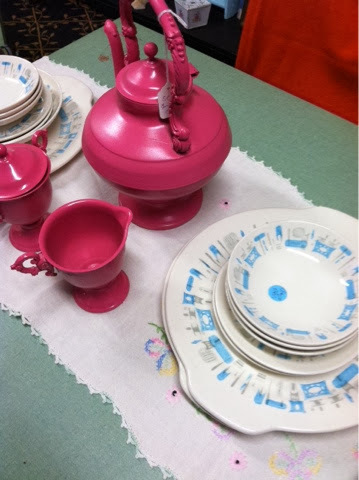 The popularity of the 1950's and 1960's day dishes are quite sought after. The 1950's homemaker of Donna Reed's time took great pride and accomplishment in setting a lovely table, not only for holidays and celebrations, but for every day. And often, the evening meal was served in the dining room, while breakfast and lunch were dined on in more of a nook or smaller table, not so fancy. 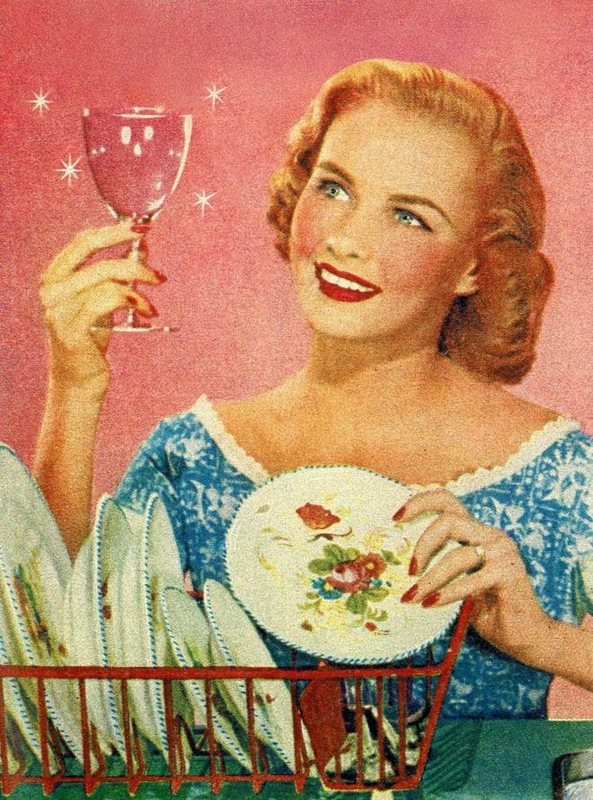 Keeping ones dishes and glassware sparkling was indeed a priority. I remember my Nana washing all her serving pieces in piping hot water. No dishwasher back then. 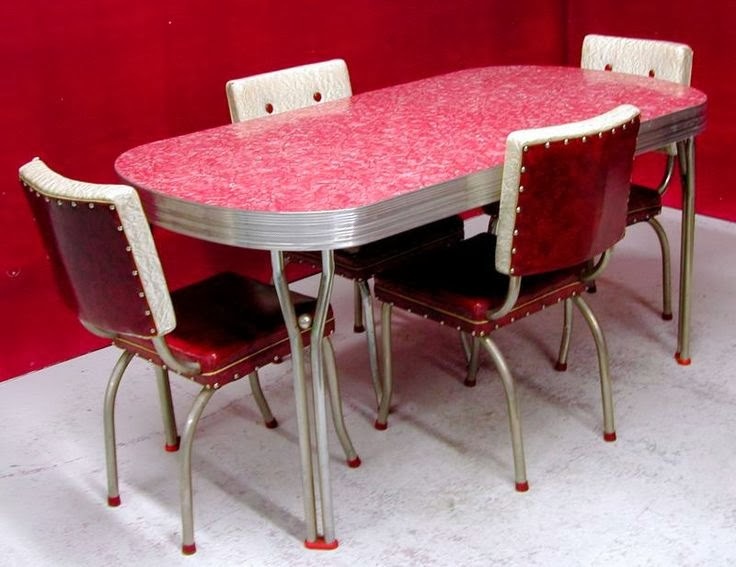 I fondly remember a dining set like the one in red, but my Nana had one in black. By the time I came along it was relegated to the basement, where the summer kitchen was. Did you know these are being manufactured again? Yes, if your in love with all things vintage you can indeed purchase one for your retro kitchen! This table setting is a bit more my taste. I love the old book pages used as place mats. I think I may have found a way to laminate them, so as to not throw them away. 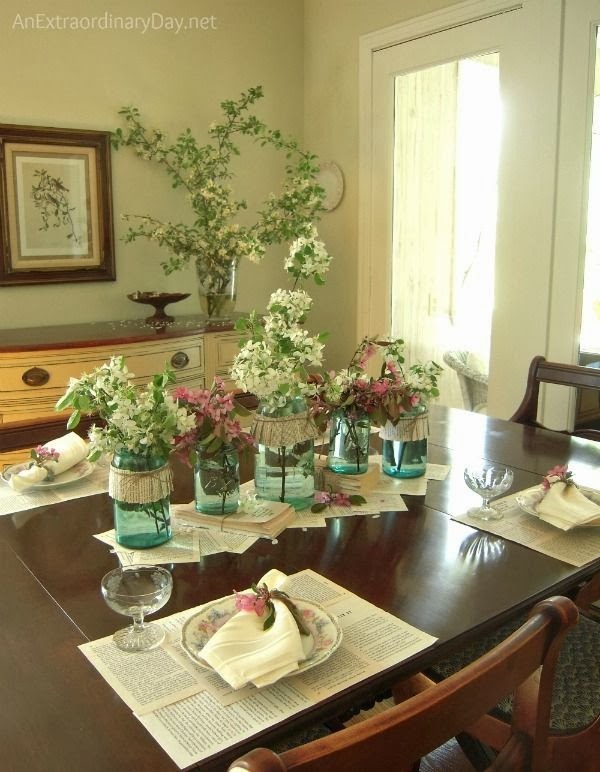 The use of the old blue canning jar adds a vintage chic flair don't you think? Love the cocktail cups by each plate. I wonder if fruit cocktail would be served, or perhaps a scoop of sherbet. 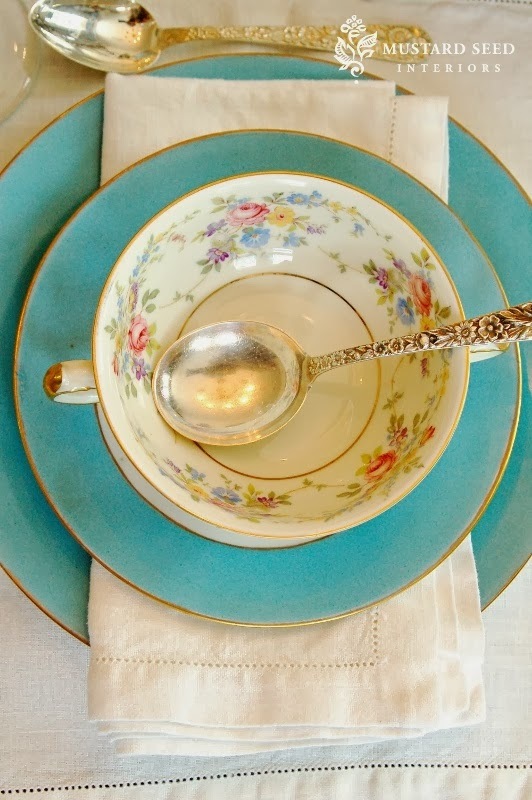 I don't save my blue willow china for holidays and celebrations. I will often set our table with it to change things up. For some reason everyone seems to sit up a bit straighter and be a bit more careful with manners when the blue willow makes an appearance. My thoughts have turned to all things Spring, like daffodils and hot cross buns. Easter is upon us and I love planning a menu for this special dinner. The blue willow is set amid sprays of flowers in season. Little chicks and bunnies made of plaster adorn the table as a whimsical decoration. At Easter I do wish the wearing of hats were back in fashion. Nothing too fancy, but a little adornment to complement a special outfit would be nice. 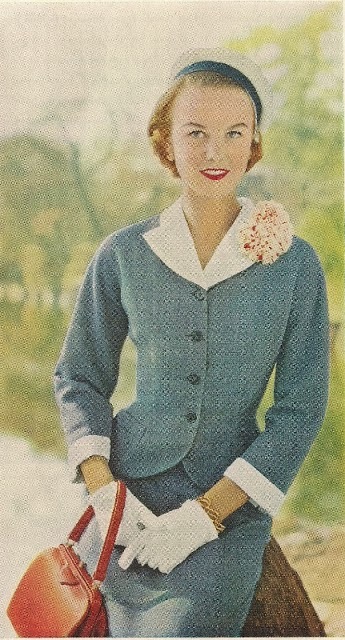 In the 1950's a woman wouldn't leave the home without her hat and gloves. Now they shop in polar fleece pants with Tweety on them! Disgraceful in my opinion. Taking a bit more pride in one's appearance does seem to be a vintage idea. Ladies, may I suggest if you have strayed from setting the table, that you give it a good effort to set a pretty table a few times during the next week. No paper plates or plastic silver! Buy or sew a few cloth napkins and use those instead of paper. Your family will be raising eyebrows and questions if their not used to this! But I guarantee your meal may not seem so rushed. Perhaps family members may linger a little longer together, chat a bit more, share hearts and laughs. Do try it and see. Hi Suzanne, this is a great blog post. I really enjoyed it. I am one who loves china and dishes, but sadly, I do not set the table too often. Holidays and tea time....then they come out! Thanks for the smiles and memories. I love the vintage table, and the newer set up, as well! My grandma had a brownish table like the one in the first picture, so it brings back memories. We do try to set the table at least for dinner time, and have the special dishes out for Sunday (although I wish we set them out on Saturday night, instead of on the actual day, like what usually happens!). What a lovely post! I love china. I am blessed to have a whole set of Mikasa that was a wedding gift. I try to use it quite often. Because, after all what good are lovely things if they are never used! I stumbled across your blog today. Count me in as a new reader! Just lovely. Looking forward to reading more. I love this post! The pictures are wonderful and the words are inspiring! I liked your comment about the polar fleece pajama bottoms with tweety on them.....I have a pair except mine have penguins.......I just thought it was funny. Thank you for your nudge. I step out of my table-setting-rut once in a while - with flowers and homemade cloth napkins, mostly on special days. I'd like to make some quilted place mats to use everyday. Your pink, blue, and yellow table set with hot-cross buns looks inviting and calming. I've been watching Donna Reed on Hulu tonight. It reminded me of your blog. I enjoyed this post very much. I need to get back to doing these things. I am really enjoying looking through your blogs! I love all things vintage, and your images are gorgeous! Where do you find them? I am trying to make the table one of my 'pretty' things to do, as it really does make such a difference.